NEW TO MARKET! 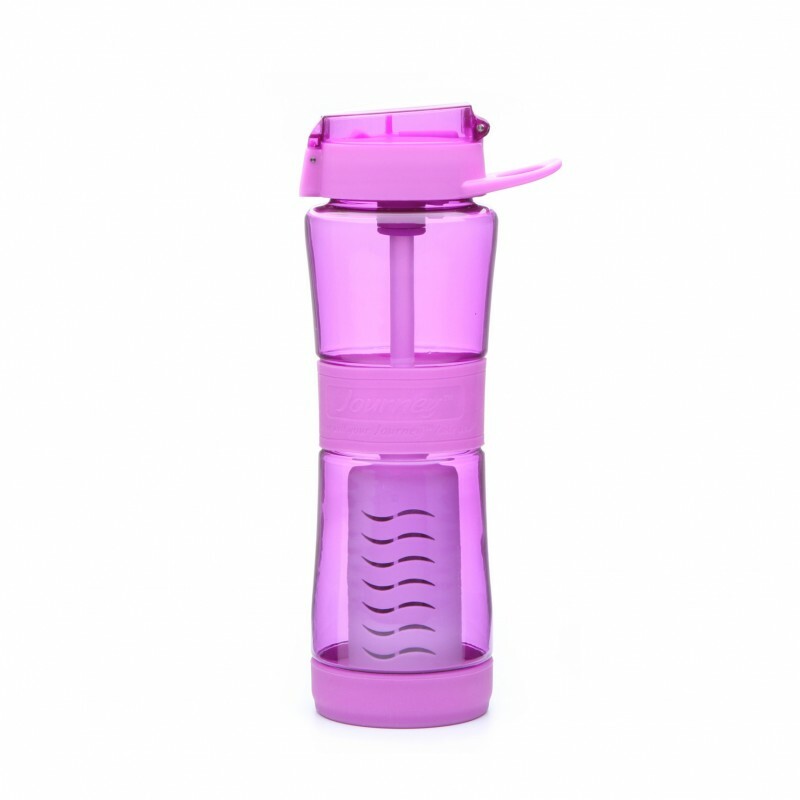 Filtered water bottle - REMOVES: BACTERIA, VIRUS & CRYPTOSPORIDIUM. Filters 946ltrs (250 gallons) of contaminated water. Bottle has 750ml (24 fl oz) capacity. The Sagan™ Journey™ Water Bottle - with filter is a filtered water bottle for everyday use, all outdoor adventures, survival and emergency preparedness. The Journey™ Water Filter removes bacteria, virus, giardia and 118 waterborne chemicals, including fluoride and other contaminants from any non-salt water source. Makes any water - safe water. View Sagan™ Water Filter Test Results performed by independent water laboratories. The best water filter you can buy for your personal water bottle. TRUST YOUR JOURNEY™ Sagan™ manufactures only BPA free water bottles. 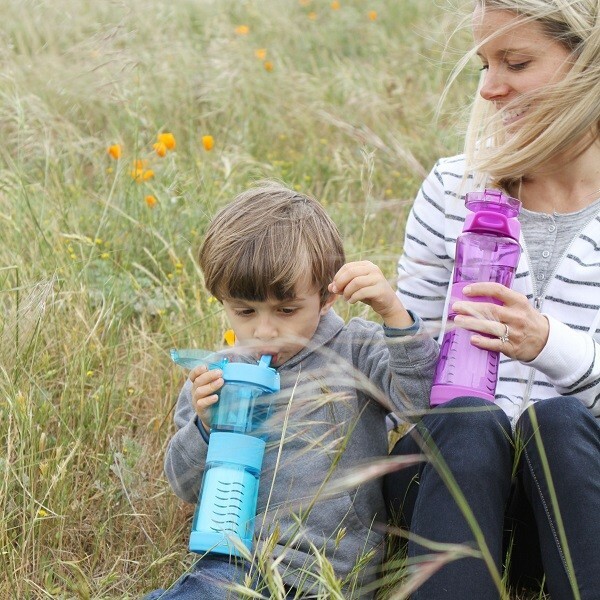 Sagan now offers the best water filter for your personal water bottle. 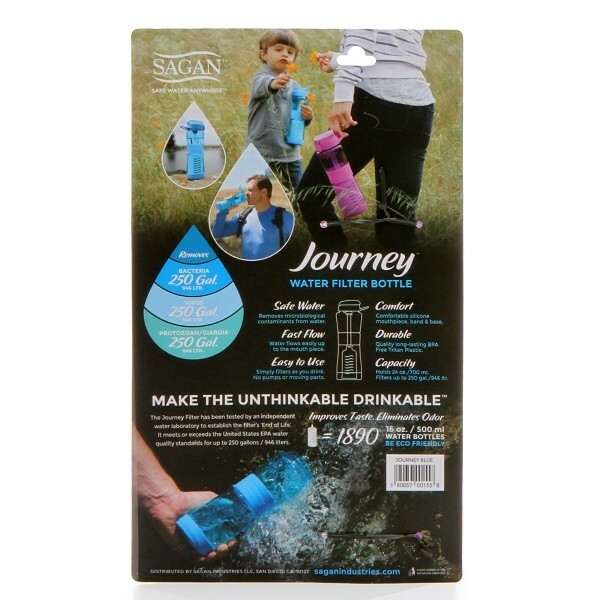 The Sagan Journey™ Water Bottle - with filter is a filtered water bottle for everyday use, all outdoor adventures, survival and emergency preparedness. 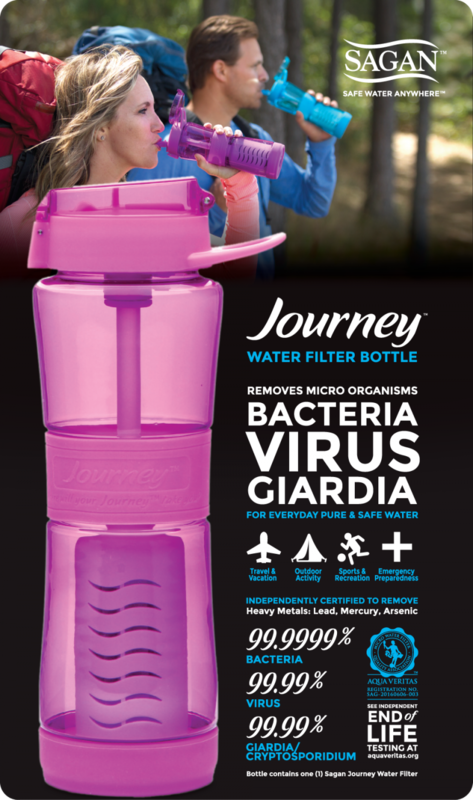 The Journey™ Water Filter removes bacteria, virus, giardia and unwanted contaminants. Makes any water - safe water. Have a look at our test results – performed by independent water testing laboratories. The Sagan Journey Water Bottle is available in Blue, Orchid and Double Walled Stainless Steel. Holds 750ml (24 oz) of liquid. Flip cap makes it easy to open. Patented "well" design allows you to get every drop. Includes one filter which filters up to 946ltrs (250 gallons) of water. Read more about theSagan Journey Water Bottle at Sagan Filters.com. NOTE: Sagan offers three types of water bottles, available with or without the Journey™ Water Filter. 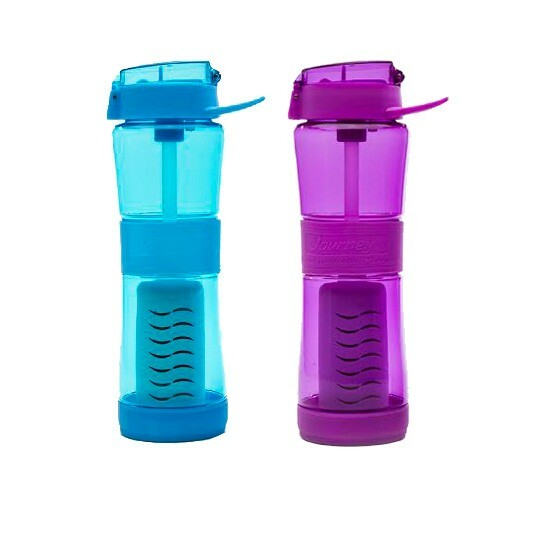 The "Journey", the "Streamer" and the"Chiller" and are sold as tremendously effective filtered water bottles or without filters as regular water bottles. Water filtration systems by Sagan™ Filters are tested to establish the water filter's "End of Life"and certified by independent water laboratories meeting and exceeding EPA standards for the removal of: 99.9999% of Bacteria, 99.99% of Virus, 99.9% Cryptosporidium / Giardia and unwanted contaminants from your water. We are taking water purification to a new level. Our water filters are absolute and we stand by our results. Make sure the water filters and filtered water bottles you are using can stand by what they claim! “End of Life” testing involves testing the filter over and over again by spiking it repeatedly with all the 'nasties' (Virus, Bacteria, Giardia, etc) until it starts to fail. It is a vital part of proving the water filter you are using does what it claims it can do. Many filters will work the first (and usually only) time they are spiked with all the nasties and tested. But do they still work when spiked repeatedly up to 100, 300, 500 or even 1000ltrs? Have they even tried to test them again? Go ask your existing water filter supplier to show you their conclusive “end of life” testing results. Sagan™ offers the best, most tested and trusted water filters you can buy for outdoor adventures, water storage, water purification and filtered water bottles for everyday use. Great for camping, hiking, backpacking, survival. 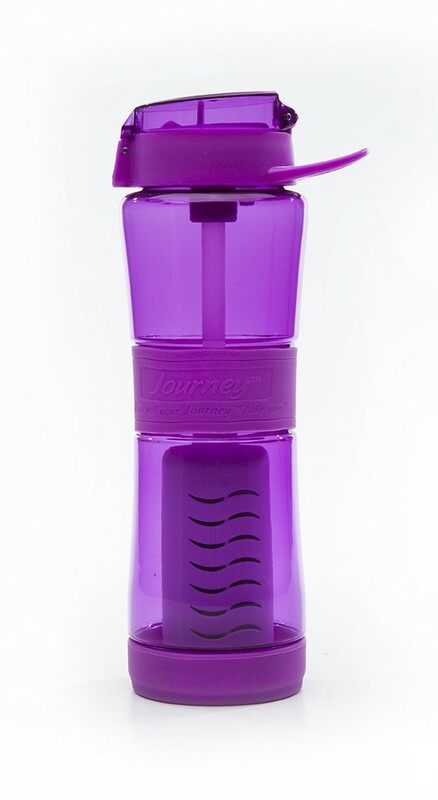 The Journey Water Filter Bottles would be perfect for travel abroad. I've used different things in India, Ecuador, and Mexico to purity water, but I can't imagine anything simpler or more reliable than the Journey bottle. No more lugging around liters of water while hiking the shade-less canyon country. This Sagan Journey Filter Bottle instantly filters contaminated water and has a lifespan of 250 gallons. As long as I have a water source when hiking, this is ALL I need for clean water. No more messy pumps, tubes and multiple (heavy) bottles.